Both men operate as independents and in the second four-wide event this year they overpowered the multi-team giants in Top Fuel and Funny Car. Pedregon’s Funny Car victory snapped a 92-national event winless streak for the Brownsburg, Ind., resident; one that went back to 2014 at Englishtown. Torrence’s Top Fuel victory was his third straight in four-wide competition. The Top Fuel point leader was the defending champion at zMAX and three weeks ago won the inaugural four-wide at Las Vegas. “I actually didn’t believe my ears when the team manager got on the radio and told me we had won,” said Pedregon, who defeated two John Force Racing cars and one from Don Schumacher Racing with an elapsed time of 4.059 seconds, 310.84 mph. 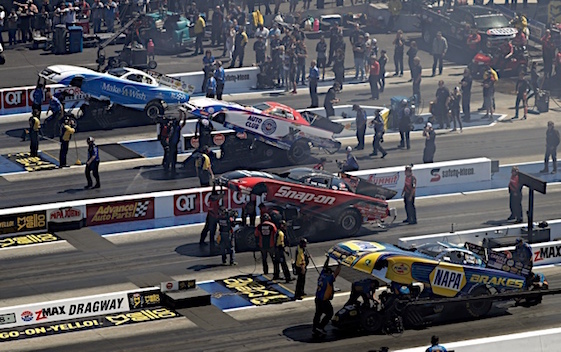 Cruz Pedregon ended a long winless streak and won the Funny Car Wally on Sunday afternoon. 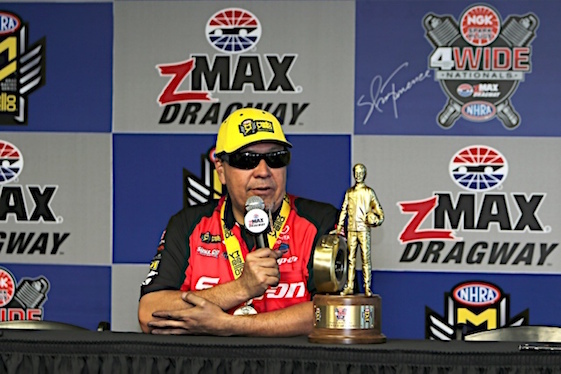 Pedregon’s 36th career Funny Car event victory, which he described as surreal, allowed him to pass Don Prudhomme for fifth on the all-time Funny Car win list. Torrence, meanwhile, has become the dominator in four-wide Top Fuel events, a performance the Kilgore, Texas, resident can’t explain. “If I knew what the recipe was (for these four-wide victories), I might write it down so I wouldn’t forget, but I couldn’t tell you,” said Torrence, who grabbed his third victory this season with a 3.813-second E.T., 326.56 mph. Torrence admitted when he went to the line in the final round he looked at the wrong side of the Tree and “double-bulbed” everyone. He immediately apologized for the faux pas after the run. Like the nitro class winners, Pro Stock’s Erica Enders and Pro Stock Motorcycle’s Jerry Savoie were emotional over the victories. For Savoie, it was a bevy of firsts; his first four-wide victory, his first at zMAX and his first of 2018. Enders hopes her first four-wide victory signals a change in her Elite Motorsports team’s fortunes. She introduced a new car a week ago in Houston and has now gone to two final rounds with it. “The changes we have made were challenging because of the personnel involved with our team and I think it speaks volumes of the character of my crew chiefs that they were able to put people in front of parts and pieces,” said Enders, who had a 0.014 reaction time in posting her victory with a 6.535 E.T., 212.73 mph. For Enders, this year’s four-wide victory was redemption for 2012 when she was incorrectly identified as the winner. Six years later, Enders made it to four-wide victory lane.